Piping-hot servings of passion and musicality were ladled out to a large Symphony Hall audience Thursday evening, April 28, as guest conductor Rafael Frühbeck de Burgos led the Boston Symphony Orchestra in an exuberant program featuring piano soloist Simon Trpceski. Aside from phonetically challenging surnames, soloist and conductor share near-birthdays (within three days, though some 46 years apart) and a musical joie de vivre that’s infectious. They combined forces with another high-octane musician, soon-to-be-bicentenarian Franz Liszt, in a rollicking rendition of his second piano concerto. Trpceski (repeat after me, Trrrrp’CHESky; informative BMInt interview here), a meteorically rising star from Macedonia, beamed out from the stage prior to plunging in, making an immediate connection with both audience and orchestra. This engaged and engaging performer seemed completely at ease as he bounded through this virtuosic romp. His playing was assured and highly energized, almost a tad too much so in the early going, as his initial approach to the thunderous passages made it seem as if he were translating fortissimo to mean “attempt to break string.” After pounding the yelping Steinway into submission, Simon (SEE-mon) settled in and treated us to a buoyant rendition that featured seemingly effortless hand-blurring technique and a tone ranging from feathery to fiery, as Liszt’s score explored the lyrical in addition to the bombastic. The communication lines between conductor, soloist, orchestra, and audience were all wide open, and the not-unexpected standing-O rivaled the performance in terms of enthusiasm. Once again: Trrrrp’CHESky. You may want to practice that until it rolls off your tongue. Bookending the Lisztian centerpiece were two other crowd-pleasers: the seldom-heard Variations and Fugue on a Theme by Mozart, Op. 132 by the underappreciated, short-lived-yet-highly-prolific late Romantic Max Reger, and Ravel’s Boléro. The Variations, utilizing the highly recognizable opening theme from the Piano Sonata in A, K. 331, are admittedly a bit of Mozartian marzipan (slathered in corn syrup), as sweet as the Royal wedding cake and not recommended for musical diabetics. Reger’s über-Romantic treatment of the melody line is highly evocative of a film score; one expected Katie Hepburn and Humphrey Bogart to materialize at any moment. Still in all, Herr Reger’s transmutations are quite clever and can be appreciated on numerous levels. Under Frühbeck de Burgos’s steady baton (no score required), the phrasing was exquisite, the BSO strings as coherent as these ears have ever heard them, and the overall effect extremely lush and polished. Boléro was very Boléro, weirdly mesmerizing for all its simplicity; the sort of music one imagines the likes of Steve Reich and Philip Glass must have heard time and again and time and again and time and again in their cribs. As minimalist as a Rothko exhibition, yet somehow captivating. FdB’s tempo was pleasingly brisk; the numerous featured soloists flawless, most especially a surprisingly sinuous and sensuous saxophone lick. The audience remained rapt throughout and, following the outrageously orgasmic climax, rose to their feet for a second time. Given Ravel’s animosity towards this piece, he may well have been annoyed at this response. All told, a triumphant and uplifting evening of music-making featuring a conductor crowding 80, collaborating with a kindred musical spirit nearly a half-century his junior and a trio of much earlier composers. The BSO was firing on all cylinders as they turned on a peso in response to Frühbeck de Burgos’s full-blooded and full-bodied conducting style, which included a particularly expressive left hand, fingers fluttering to tease out that extra scintilla of sound. Both conductor and soloist exuded music from every pore. Refreshingly, given that all of the evening’s works were essentially extended single movements, the audience was denied a Symphony Hall tradition: the opportunity to accompany the music with various inter-movement hacking and spluttering. Excellent choice of programming! Those who asked for more rarities may rue the granting of their wish if the Reger is what we get. It was a pleasant diversion, and it’s hard to imagine a better performance. They should do it again in 40 years. This was my first ever Friday afternoon concert. Does it reveal my preconceptions to say I was surprised that the audience was one of the least cough-ridden I’ve experienced at the BSO all season? 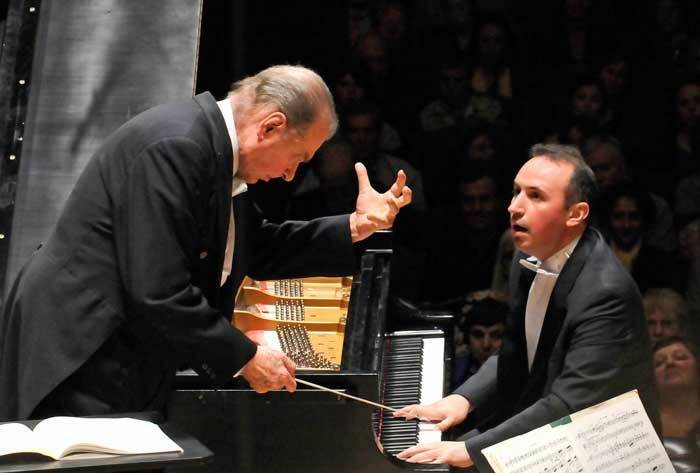 The cell phone during the Liszt was unfortunate — seemed to go on forever — but Trpceski handled it with good humor. I’m eager to hear more from him. And the man’s name just isn’t that difficult. Nor the maestro’s. Pretending they are is juvenile. At last night’s performance, listening to the Reger (untold variations on the theme from Mozart’s A-Major piano sonata) and knowing we would (too) soon be “treated” to Ravel’s Bolero, I began imagining what I would have titled this review, had I known: Trpcheski’s Liszt Relieves Repetitive Refrains. Having bought a last-minute seat in Row C, where I could easily see the BSO players, I could feel their pain. As for coughing (viz. Bill, above), at the conclusion of the first run of absolutely ravishingly beautiful, delicate pianissimo passages in the Liszt from soloist Trpcheski, some *%#*! in the balcony broke the spell with a cough – unmuffled. Trpcheski cast a quick, dismayed glance toward the offending sound. As for Trpcheski, bring him back. And back. And back. Repetition is in order, here. In fairness to the reviewer, I feel the need to say that a surname that begins with four consonants “trpc” is phonetically challenging, contrary to what one of the commenters may say. Mein Gott. Blame the Benadryl (2 tablets). The correct spelling is Trpceski.